I had so enjoyed the first non-objective paintings with a musical theme I decided to round out the year with a couple more. I enjoy the effect different color schemes have on similar paintings. The warm color scheme on the left feels lively and vibrant, while the cool color scheme is more calm and soothing. You might find it interesting to read this interesting article "Color Psychology: How Colors impact Moods, Feelings, and Behaviors" by Kendra Cherry. 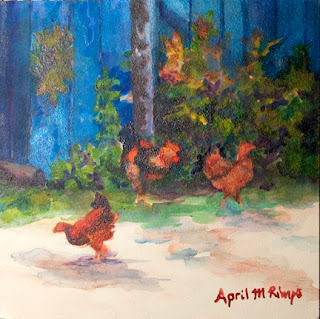 The first painting was done on a gallery wrapped canvas, so I opted to use acrylic paint. I find acrylic works better on canvas than watercolor. For the cool color scheme painting I used watercolor on watercolor paper; I do enjoy the flow of watercolor on paper. 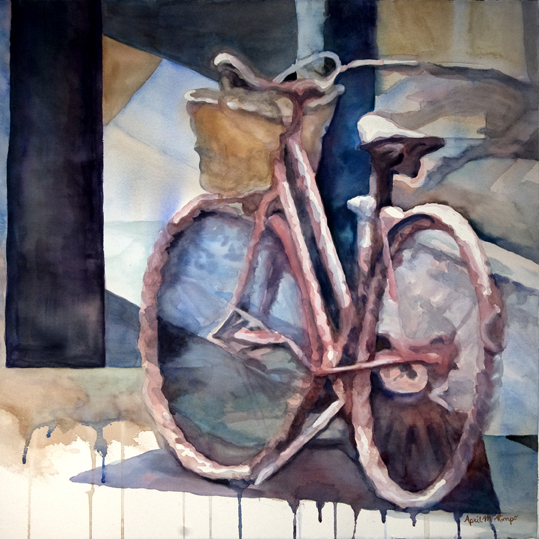 To create the lightest blues and grays I mixed darker watercolor pigments with white gouache. Both paintings are varnished with an acrylic varnish so neither is framed under glass. To read about gallery wrapped paper visit my blog on this topic. On a trip to the Hudson River Valley a few years about, my husband and I visited a few wineries in the area. We arrived at one winery about an hour before the tour was to start so we wandered around the grounds. It was mid-morning but the light in October on the Hudson Rive is essentially early morning light; there were great shadows and lights. As you all know by now, I am drawn to scenes with great shadows and lights, so I took many photographs to help me remember the mood of the scene. 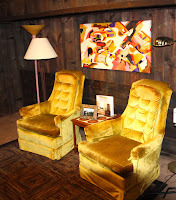 A couple days later, my husband, brother, a friend and I attended a Levon Helm "Midnight Ramble" concert at his studio home in Woodstock, New York. We loved the concert and were so happy we got to see Levon one more time before his death the following year. He and his band were truly amazing. 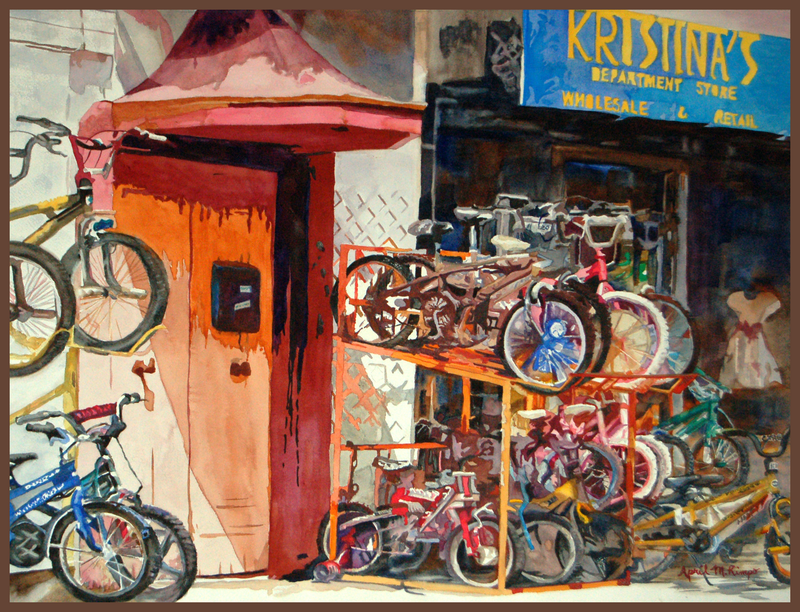 This painting brings back all these memories for me. I'm sure you too have seen places like this and I hope this painting brings back equally good memories for you. I recently had the challenge of creating a painting for a very dark space in a home with brown carpeting, dark brown stained barn board walls, and no windows. If you didn’t turn the lights on you couldn’t see well enough to walk across the room. I felt the painting needed to have a lot of white and bright colors to helps brighten the room. This room is adjacent to an entertainment room with a bar and is decorated in a musical theme. Although it's an abstract painting, I wanted there to be some connection to music in the design. 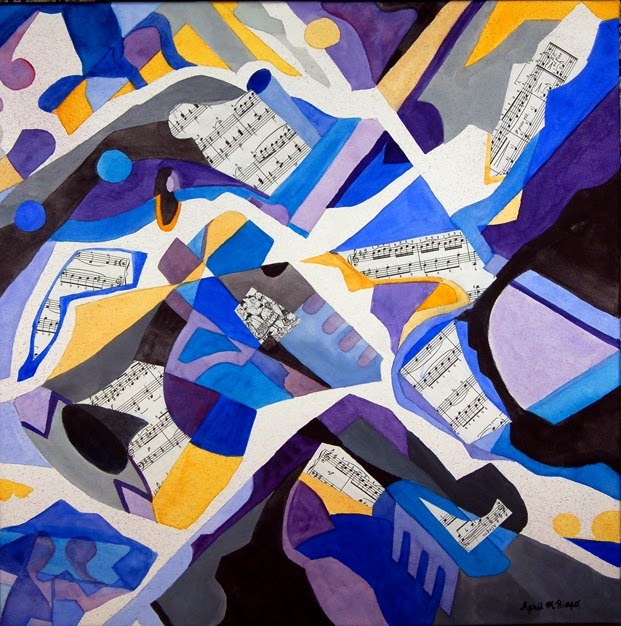 The shapes used in the abstract harken back to musical instruments and notes and sheet music was incorporated as collage elements. I started by developing the design on tracing paper, adding white “charcoal” where I wanted to retain the white of the paper and gray shading where I wanted dark black. This was my value pattern for the abstract. Since this home is in a wooded area I felt using the colors of Fall would be appropriate to transition between the dark and white areas while provided the color needed to brighten the room. In other paintings I used a complementary triad of orange, green and purple, so a few spots of purple were scattered about the painting to increase vibrancy. If you compare the value pattern shown above with the finished painting, you can see that pattern was a guide that I modified as I developed the painting. I divided the transition areas between the white and black areas to allow more color variations. Some white areas were reduced in size and shifted in position to create a more interesting flow and rhythm to the painting. Lastly, some calligraphic touches of musical notes and symbols were added. Every Fall I walk around our neighborhood talking photographs of the trees and the beautiful colors of the fall foliage. Unfortunately this year there were not many colors to be found. Apparently the weather conditions weren't conducive to leaf color change, so most leaves had changed directly from green to brown and fallen. There was one very small tree nestled among the larger ones that had turned red, gold, and orange. The sun lit this tree so it glowed, jumping out from the shadows. A good friend and I decided to have a paint-in one wet day, so we huddled in her studio and worked on our own creations. It seemed like a good opportunity for me to work from the photos I had taken of the little tree. I wanted to share the beautiful lights and shadows of that day, so A Spot of Color was born. This painting is acrylic on a gallery wrapped canvas board. I plan to include this little painting in an exhibit held each year during the first couple weeks of December at a local art center. 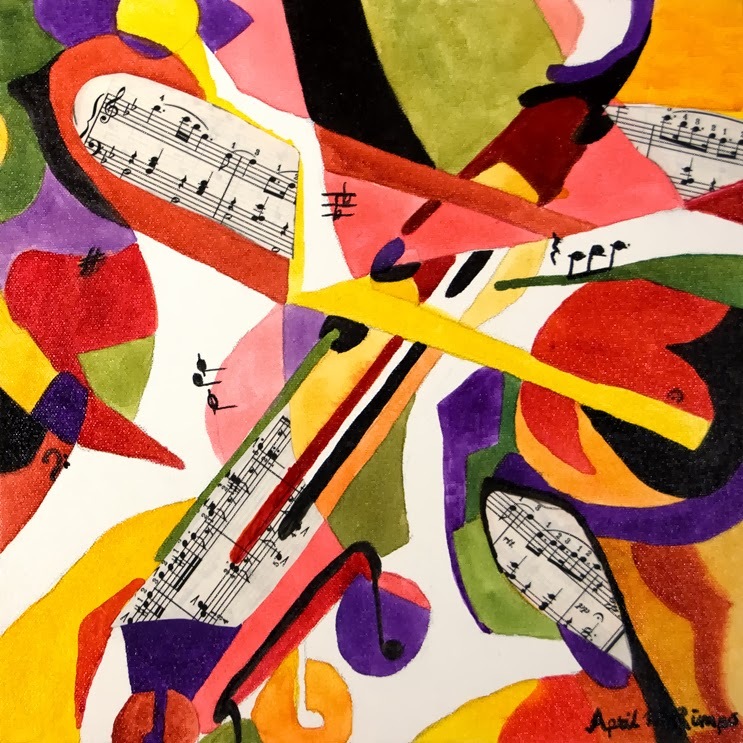 The exhibit is called "Singular Sensations" where local artists can share some lower priced original art to the public. See the variety of art produced in the area is always great fun. When in a large city tall buildings abound. This also means views from above are just waiting to be captured. Aerial Bikes I does just that. 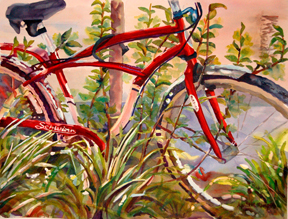 I've done several paintings of cycles, but these have all been “ground level” views of the side of the bicycles. After all this is the most recognizable view and one of the “rules” is to make sure the elements in your art are recognizable. Although safe from a recognition perspective, it is sometimes fun to take a different look at common things. That is what I did in Aerial Bikes I. Stay tuned for more aerial views in the future. To see available prints check my store. 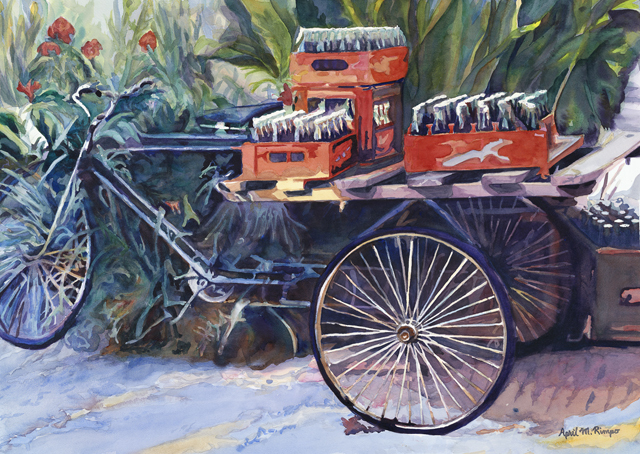 "Delivery Trike" and "Ready to Roll"
Art after retirement - "Department Store"
Images of these paintings are shown below. When most people go to NYC they probably take pictures of The Empire State Building, The Chrysler Building, Time Square, the Flat Iron Building, Freedom Tower, and of course the Statue of Liberty. Like everyone else I take those photographs, but I also am intrigued by what is on top of all the other buildings. There are all kinds of interesting equipment, water towers, heat and cooling systems, and other things that I don’t really understand. The tops of buildings feel much like little cities of their own. They often look like a throw-back to another era. I’m especially intrigued by the water towers, which I assume are for use in case of fire. 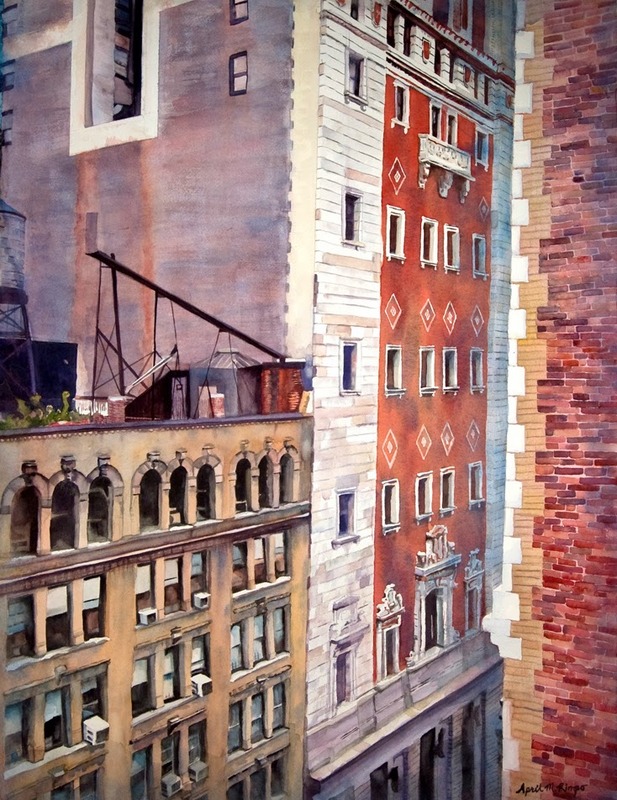 My painting, Intersections is my homage to the rooftops and the amazing architectural details on so many of the building in NYC, the view from on high. In a way I consider scenes like this as portraits of what keeps the city going, the internal workings of the city. 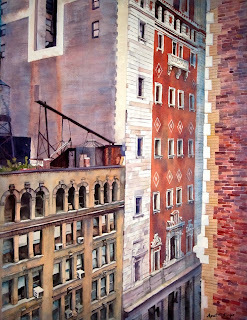 I also hope to help others see the scroll work and other architectural details that looms above your head as you walk the streets looking for the perfect restaurant, your hotel, or as you make your way to a show on Broadway. 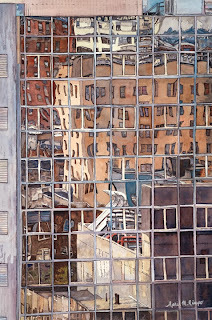 reflections of older buildings in a modern glass building. Included in the reflections are elements from the roofs of older buildings. My goal is to meld the old with the new, joining architectural eras through the reflection. For me the details of the chimneys and ventilation systems are part of what makes it interesting to explore this painting. 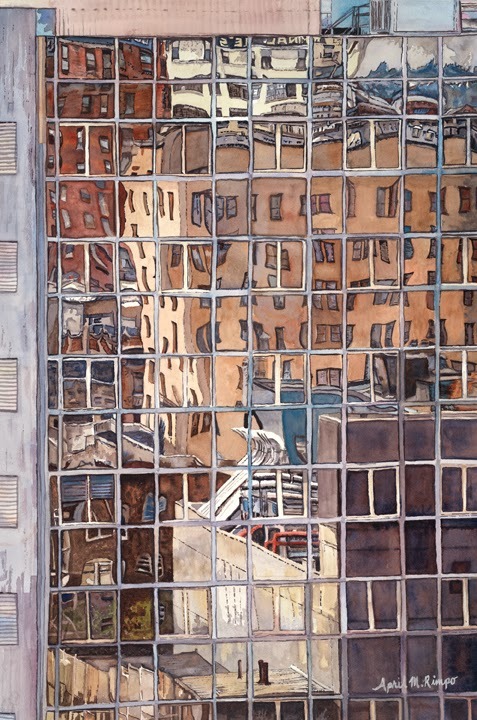 As in Intersections the normally unseen is brought to the forefront in City Reflections II. This painting was based on a photograph I took in Seattle. I hope you enjoy my silent nods to parts of the city less traveled. To see available prints check my store. I've been having a blast creating small paintings for the last few weeks. It started after a friend of mine told me she was going to do a 6"x 6" painting every day for the last 3 months of this year. 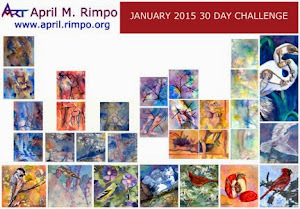 Her goal: 100 paintings in 100 days. I decided that since I still have some large pieces I'd like to do for a variety of exhibit possibilities, that my goal would be to do one large painting and one small painting each week. acrylic on paper, matted and framed 10" X 8"
Well, since I was finding these small pieces so enjoyable I have exceeded my small painting goal, but completed only one large painting in the last two weeks. I'm actually okay with that, since I feel I am learning a number of new things in the process. As you scan down the images at left, you can see that many of these were done using fluid acrylic instead of watercolor. Often I'll combine fluid acrylic with watercolor in my paintings because I like some of the textures I can create with fluid acrylic. However, in these small paintings I used only fluid acrylic. 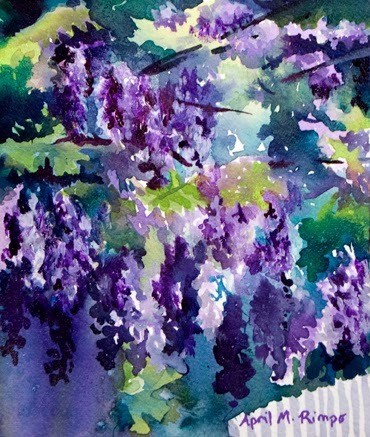 Working very wet into wet, they appear much like watercolors, with the exception of Wisteria I, where I intentionally thickened the fluid acrylic paint with an acrylic medium to be able to raise some of the wisteria blooms up off the surface of the paper. The two water scenes were done "en plein air" (i.e., on site outdoors). 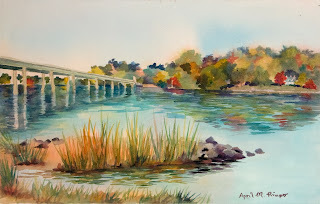 A fellow artist and I went to a lovely spot in Annapolis to paint. Everywhere we looked was another great view asking to be painted. There was even a group of a dozen kayakers who departed from the park where we were painting. Too hard to paint fast enough to capture them, but since I had my camera with me I hope to capture them soon in a studio painting. As I progressed with my small paintings I decided it was a good time to try different platforms. 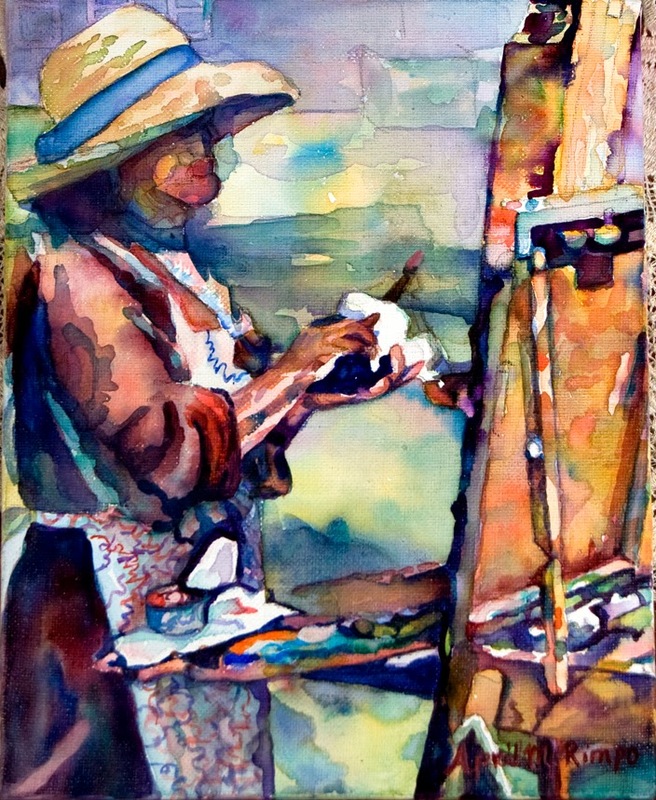 Instead of working only on paper, some were on aquabord and others on canvas. Chickens in the Road is the first of my acrylic on aquabord paintings. Aquabord is a product by Ampersand that is made with a clay-like surface on a Masonite-like base. It was created specifically for people who work in very wet media, like watercolor or fluid acrylic. You can paint on it very much like working on paper. When done, you spray it with a fixative to protect the clay surface, then use an archival mineral spirit acrylic varnish to further protect the painting. The painting can then be framed without glass. Years ago I painted with oil on canvas, but Artist at Work I may be my first painting on canvas using a water-medium. Again I decided to use acrylic rather than watercolor. Some canvases are prepared specifically for watercolor, but this was not one of those. I decided to try using very watered-down acrylic to see if it would work on the canvas. I very much like the final result. When looking at this in a larger image, the texture of the canvas is prominent since the acrylic was so thinned out. I feel that texture enhances the abstracted appearance I wanted for this painting. 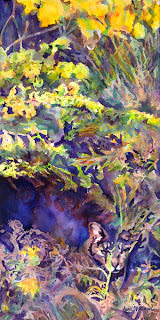 Meeting in Provence, is the only sample in this post of a small watercolor on paper. Unlike my larger watercolors, I wanted a simple scene that was striking to look at because of my use of color and strong contrasts. These two appear to have met on the street and struck up a conversation. I plan to continue my exploration through small works and hope you will join me along the way. It would be great if we too could strike up a conversation as they did in this painting. Be sure to click on the verification link you receive in email to finish signing up. Beauty is definitely in the eye of the beholder. I suspect that when we were driving down the road in Vermont looking for a covered bridge my husband never expected me to ask him to turn around and go back for a couple of old rusting cars in a field. The car closest to the road is the one that caught my eye, but as I walk across the field I discovered there were actually three cars. The one shown here was not the one that initially caught my eye. However as I wandered from one car to the next I found the interlacing of the flowers with this car to be the most compelling. There is something about these kinds of contrasts that often draw my attention. I find just about anything can be an inspiration for a painting. My husband has apparently learned this with time because he no longer questions me about why we had to drive back to a given place. I hope this is because he likes the result when I finally get around to doing the painting, but it may simply be easier to go along with it than to challenge my inspiration. I have even found when traveling with other artists that what draws my eye is not the same things that draws their eye. 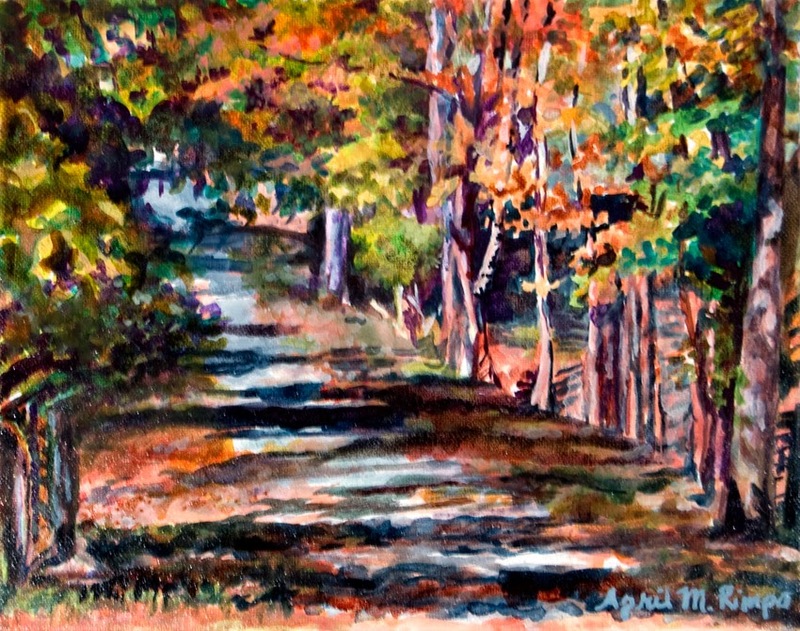 I went for a drive one late afternoon with a fellow artist who was taking the same workshop as I. We were out getting the lay of the land with no particular destination, so I kept stopping to take pictures of the birds, landscape, houses, whatever caught my eye. As we were returning to the hotel where we were staying I stopped one more time to photograph an egret in the marsh. She had not seen the bird and mentioned how amazed she was at all the things I see; especially since I was the one driving. You may be thinking you don’t want to be anywhere near me when I am driving; that I am a road hazard. Well I think I am safer than other artists I know, since I do this in very rural locations and I do pull over to the side of the road to take the pictures. A short walk to get back to the location is not unusual. I know some of my artist friends have actually figured out how to take pictures when driving down the highway. Yikes! I guess it is all relative. Well I hope the crazy inspiration for this painting makes you smile and maybe even takes you to a place in your past. Let me know about what inspires your work. If this painting really "tickles your fancy" and you might like the original or a print contact April. Samples of some of my limited edition prints are available in my online shop. This painting makes you spend some time searching for the lead character. Enjoy the abstract and see what you find. While you do that, let me tell you about the color scheme and technique I used. Below is the color scheme I chose for the painting. This is a tetrad, which is a combination of four colors. In this case, it consists of two sets of complementary colors. My goal is for the predominantly golden/tan tetrad with purple and cerulean/pthalo blue complements to make the foliage an interesting abstract. I included some greens which were created by combining the blue with the yellow and golden pigments. I find pthalo blue creates beautiful greens when combined with nearly any yellow pigment. By using the same pigments, the green shades are cohesive with the other colors. I used my favorite site, colorschemedesigner.com, to select the tetrad. 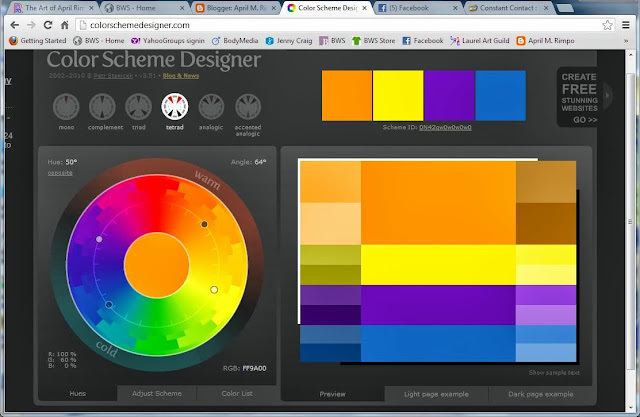 This site is free and is a wonderful resource for playing with colors before beginning a painting. Once I've selected the colors I then select my watercolor and acrylic pigments and often do some color swatches to ensure the pigments play well together without creating muddy colors. Since yellow and purple can easily lead to mud I decided to use fluid acrylic for most of this painting allowing the yellow to dry before coming back in with purple. Since acrylic doesn't change after drying, these colors can be used during separate painting sessions without them blending together. I used watercolor with the acrylic to add color shifts that I couldn't achieve with the more limited set of acrylic colors I selected. OK have you found my hidden star? He is using his camouflage to hide in the foliage yet he has a great view of the world around him. 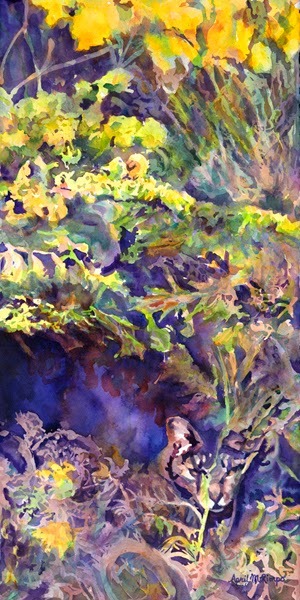 I wanted this painting to emphasize the concept of hiding since this critter loves to hide. I abstracted the foliage enough to make it readable as foliage without details that would make you focus on any one part of the foliage. The only part that is detailed is my mystery star, but he is camouflaged in the ground cover and partially hidden behind the plants above him. Have you found the cat? By shifting the color of the cat to include non-standard purples the camouflage is enhanced. 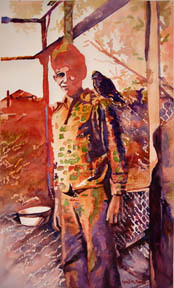 The same purple is used with varying color shifts in all the shadows throughout the painting. Let me know if you found the cat before I told you. I have paintings in the "Interpretive Realms" exhibition at Agora Gallery in Chelsea, New York City, NY starting this week. It is always exciting to be included in an exhibit, but there is something very special about an exhibit in New York City. I've included here images of my art that will be on display and links to earlier blogs on these paintings. Agora Gallery is a contemporary fine art gallery established in 1984, dedicated to the promotion of national and international artists, providing original fine art to established and emerging collectors and catering to special events in support of fine art organizations that foster social awareness and promote environmental issues. The gallery is also the publisher of ARTisSpectrum Magazine and the sponsor of ARTmine.com. You can find April's profile in ARTisSpectrum Volume 29: The Chelsea Perspective. Here is the Press Sheet they released regarding my art. 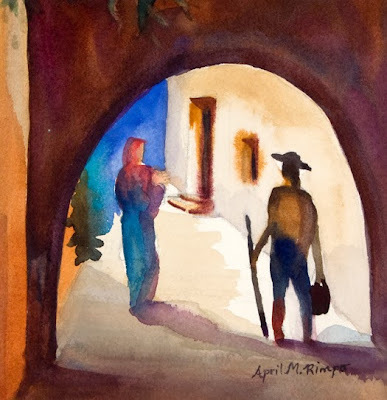 American artist April Rimpo paints luminescent compositions in watercolors and fluid acrylics whose glowing hues and evocative textures are in sharp contrast to the softer tones typical of most watercolor paintings. Her transporting imagery renders scenes both familiar and distant — from American cityscapes to picturesque vistas in Europe or Latin America — in vivid, bright colors. 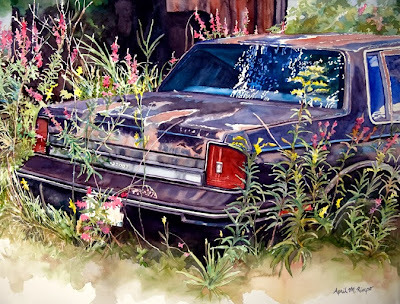 Though her work is firmly rooted in realism, she also allows her paints to flow, meet, and meld, injecting elements of chance into her carefully and dynamically composed paintings. “I watch it flow and respond, allowing the piece to develop in directions not fully planned,” Rimpo says of her method. 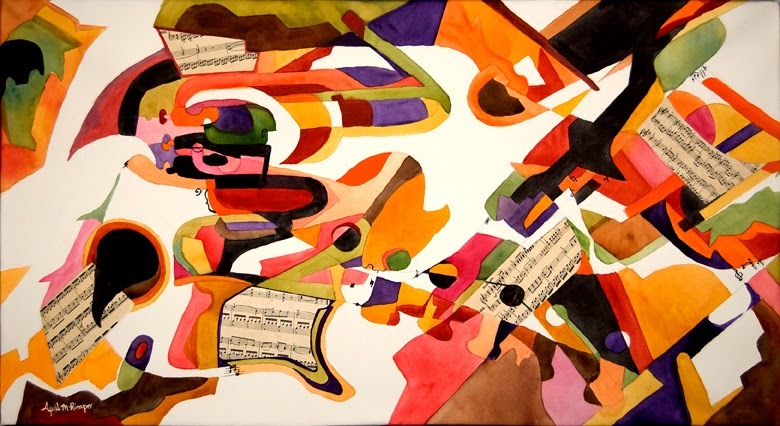 “This is part of the thrill of working in watercolor that I didn’t find in other media.” She intrigues viewers by juxtaposing areas of near-abstract color with precisely outlined and filled in elements. This incredible variety of modes of application and imagery leaves her audience to complete the details of areas which have been washed over in seductive and dramatic hues, drawing them into the work. I always enjoy depicting scenes of everyday life. Madison Square Fountain captures mid-day in Madison Square Park, New York, NY. Lots of people were out walking; some were enjoying the sun, some enjoying the garden and fountain, while others gathered in the shade to talk. My goal was to capture the essence of city life in Madison Square Fountain. I enjoyed having spots of light hitting some of the people in the shade so I could have variations in the intensity of the shadows. I felt this provided movement and life to the painting, truly capturing a fleeting moment in time. 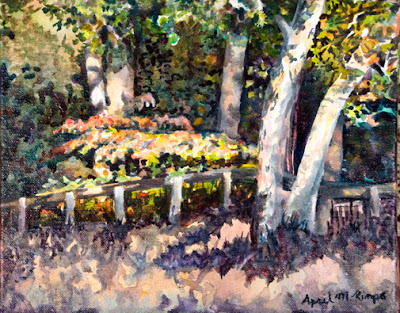 The combination of bright sunny spot and areas in the shadows of unseen trees allowed me to have the intense colors of flowers and the saturated colors of shadows. Shadows on planters and the fountain were started with bold greens and blues to establish a base saturated with color. I gradually added in more blue washes and lastly some dark neutral gray washes to increase the depth of the shadows. By starting with intense colors these areas feel lively. I used a similar approach on some of the people in the foreground. For example, you can see red and blue glowing through the shadows on the clothes of the woman at the center.. Other foreground people toward the edges of the painting were done primarily in grays to help keep the interest toward the center of the painting. I hope my handling of this scene captures this moment in time and makes you feel like you are there in the city. * Contact April regarding shipping outside the United States. This or any other questions? Just ask here. A couple years ago I decided to do a book of family portraits as a surprise gift for my mother. Since these were for my family I thought I should experiment with a variety of styles to help me learn and also to keep the project fun and exciting. There is nothing like trying a new technique to keep you work fresh and challenging. All except two of these were based on black and white photos taken in the 40s and 50s. In some ways that gave me to opportunity to play with color since there was no bias introduced by the photographs themselves. Here are some examples and a little bit about each approach and why I selected the style for each painting. 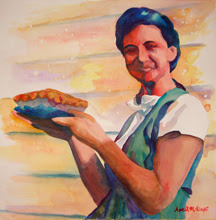 We have all seen the ads from the 40s of the woman holding a coffee cup and of Rosie the Riveter. These ads used bold colors, bright yellow backgrounds, and a graphic style. This painting gave a nod to that style, where I simplified shapes using contours and exaggerated colors. I didn't want the stark yellow background used in many of those ads, so I muted the yellow slightly and sprayed it with water to create spots and soft areas to contrast with the figure. 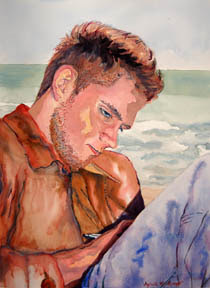 This painting was based on a photograph of my son when he was drawing. 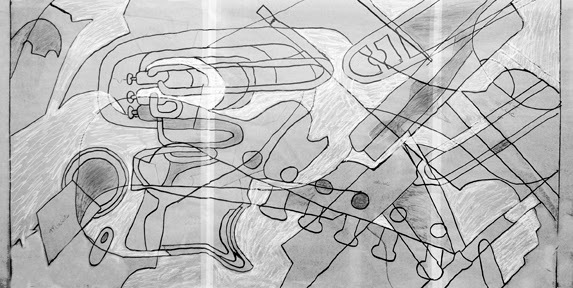 Most of his drawings are line drawings in graphite, which he then scans and augments on the computer. I wanted to bring in the feel of his line drawings, so I used watercolor pencil to add outlines to his features and to create his beard. See the closeup at right to better see the approach. 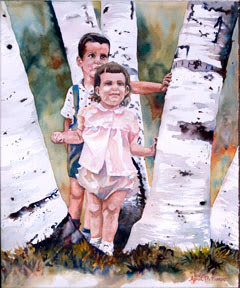 Since this painting was of my brother and I as children, I wanted a soft painting that portrayed young innocence. Using soft colors for our clothing and the shadows on the birch trees kept the painting light while the dark bark and grass at the base helped force the view back up into the center. My brother always protected his little sister so his pose with his arm up, although likely unplanned, made me feel like he was providing a shield. 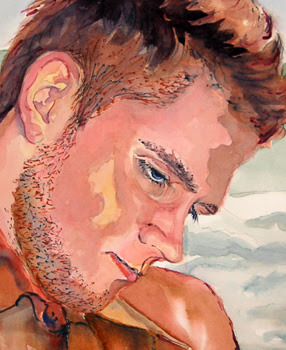 I strengthened the color in his arm to keep that gesture from being lost in the background. When on vacation in Deep Creek, the innkeeper where we were staying asked whether I ever painted in sepia. 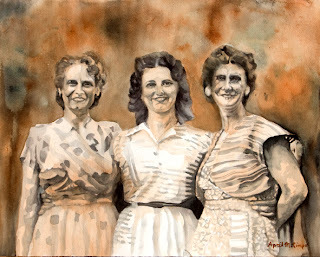 I couldn't recall if I ever had, but thought that would be a wonderful way to paint one of these portraits since sepia toned photographs were common in the era of some of the source photos. I started this painting using a grisaille approach, using shades of gray, to capture shapes, their hair, and the patterns in their clothing. Then I added pale washes of burnt orange reminiscent of old sepia tone photographs. Similar to the approach used for the portrait of my son above, I used line-work in this painting. However in this painting I used charcoal, instead of watercolor pencil, to achieve heavier lines. 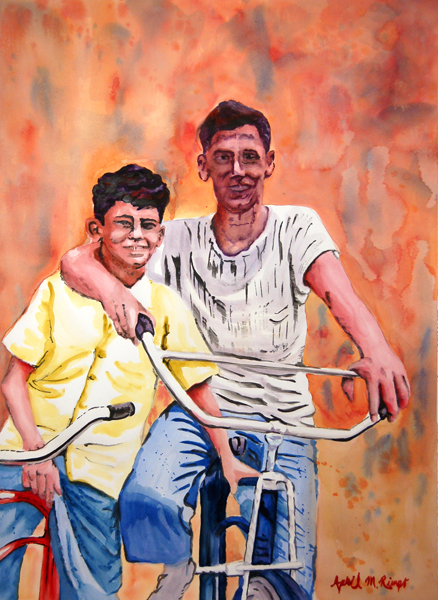 I had used a bright background that I didn't want to become the focus of the painting and I felt the heavy lines added interest and kept the focus on the boys. This painting is called Speed. 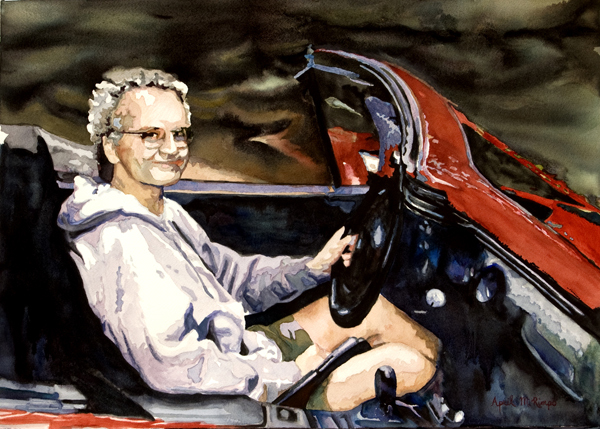 My brother was so happy in his new sports car that I wanted to paint it as though he was streaming down the road. I abstracted some of the shapes of the interior of the car to keep the focus on my brother, then intentionally blurred the background as though the foliage along the side of the road was out of focus as he flew by. I incorporated some of the red from the car in the background and formed it into flames to help emphasize a sense of speed. I think it is important when doing portraits to include notes about the person or the times to create an interesting story and help communicate a bit about the person. I think choosing the approach to the painting ended up being an important part of telling each story in a unique way. I think the same is true when telling stories about places and things and hope my art succeeds to convey a place and time. Let me know which of these paintings spoke most to you and why. I'd love to hear whether the approach I used conveyed a bit of the story before you read my explanation. To learn more about my art and to see other examples check my website, browse my online store, and check the commission page. You may also want to read my blog post on commissions. 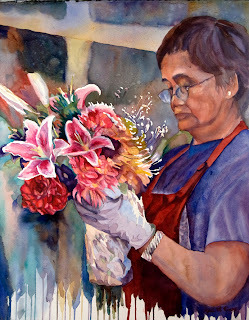 "Flower Vendor" watercolor 22" X 17.5"
Flower Vendor is my third painting about vendors. In each case the vendors seem to be small business owners. 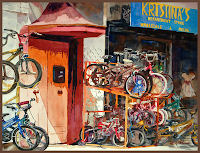 This painting and The Vendor are based on people here in the United States, while Fruit Vendors features Guatemalan vendors. Perhaps I am drawn to these because I grew up in a family that has a small business and know the long hours it takes to make a venture succeed. Each of these paintings capture the vendors concentrating on their wares. Although the vendor is an important character in this painting, it is the flowers I wanted to highlight. To accomplish this, I used blue pigments to mute the background and the woman while keeping the central flowers bright warm colors: yellows, reds, and pinks. The woman has a red apron to help create a consistent color scheme throughout the painting, but the red is more subdued than in the flowers; I added blues and purples to reduce the vibrancy of the apron. I also reflected golden and red colors from the bouquet in the vendor’s face but again used blues and greens in her flesh tones to keep you focused on the brilliant flowers. Of course I want you to look at the woman, but when all is said and done, it is her love of the flowers that I want you to admire. At left is the triad color scheme I chose for the painting. 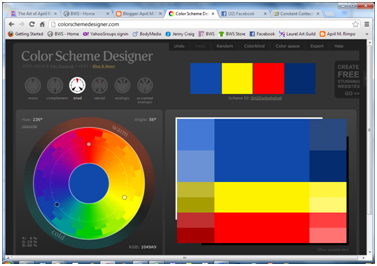 I ended up shifting the yellows toward gold and the reds toward pinks, but I did retain the concept of the blue triad. 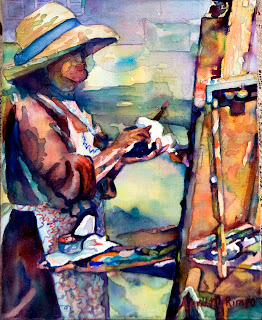 Primarily cobalt blue is used in the initial wash to help push back the background and much of the woman allowing the bright colors in the flowers to be the star. I used a very wet wash in the background so a wide variety of colors could mix on the page creating a beautiful backdrop. After the first background wash had dried I added a second dark wash created from a variety of dark pigments. As the second wash was drying I sprayed it with a mist of water to create water spots, which further diffused the background and revealed some of the underlying color. 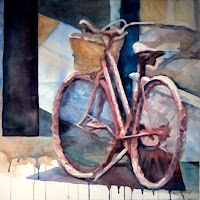 I happen to love drips in watercolor paintings since it reveals the fluidity of the medium. I wanted drips across the bottom of the painting. Although the woman was placing flowers in a vase I decided to change it to wrapped flowers where the stems are sticking out of the bottom of the wrapping. This way the stems could also be created from drips. April has prints of many of her paintings, if you don't see one in her online store ask her about availability.